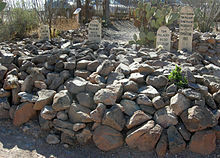 Boot Hill Cemetery was founded in 1878 on a hill northwest of Tombstone, AZ. It originally went by the name “The Tombstone Cemetery” until 1884 when a new cemetery was built at the end of Allen Street. The name Boot Hill was bestowed on the cemetery when many of the dead buried in its dusty grounds died quickly and with their boots on. Many were murdered or died in other brutal Wild West customs. Time has taken its toll on the cemetery and its headstones. Many of the graves were in poor conditions, with the wood markers rotting making them hard to read. Lots of the markers for many of the graves could be off by two feet but are close to the original location. There are over 300 bodies buried in the cemetery, with about 205 known and recorded graves. Some of the headstones have the person’s nickname etched on them because their real names were unknown. Many famous outlaws and lawmen are buried amongst the lesser known people who once called Tombstone their home. People such as Tom and Frank McLaury and Billy Clanton who were all killed during the gunfight at the O.K. Corral. Billy’s father, Newman Hayes Clanton or “Old Man Clanton” was originally buried elsewhere but his sons, Ike and Fin, had his remains moved and buried next to Billy’s. Some of the others buried in the dusty grounds of the Boot Hill Cemetery are Billy Clairborne (shot by Frank Leslie), Margarita (stabbed by Gold Dollar), Marshall White (shot by Curly Bill Brocius), and of course Lester Moore whose headstone reads, “Here lies Lester Moore, four slugs from a .44, no Les, no more”. 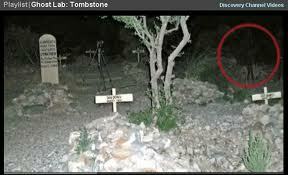 Today there have been many claims of ghosts wandering around the cemetery grounds. 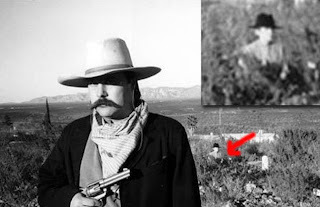 Some people have captured cowboy ghosts or shadow figures in their photographs. Great post. I love all the legends surrounding Tombstone. I would love to visit there someday. I'm sure that place is very haunted with all of the tragics deaths that happened there. I have to admit that, as campy and overdone as the cemetery is, it has a weird location and strange feel to it. It is rather spooky. How cool... is Boot Hill worth seeing?? Vivienne; it is a fun little Wild West town to visit with lots of history. Sis; we should visit it the next time we are there and check out the OK Corral too. I know we didn't have time on our last visit because we had ghosts to hunt in the Bird Cage Theatre. Red Shoes; If you are visiting Tombstone for the first time, it is worth a visit. I'm actually kind of a nut about Tombstone history so I've always wanted to make a trip. One day! Cool! Tombstone history is so interesting.